Malaysia’s debt fuelled economy on steroids was the result of Bank Negara’s policy of low interest rates causing abundant availability of credit. 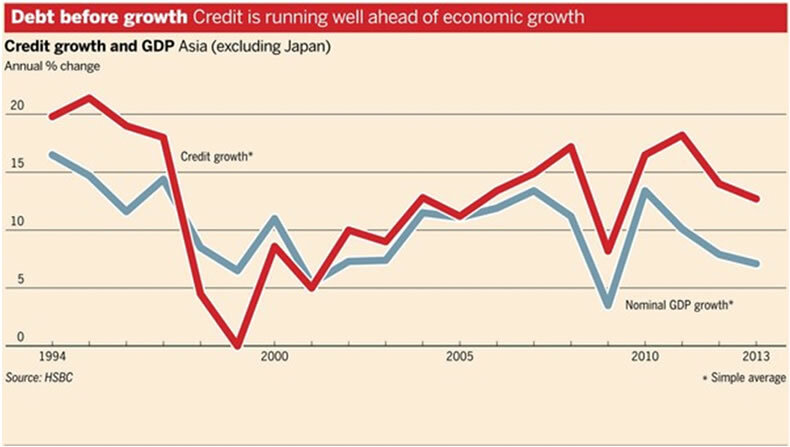 To avert the economy from free falling credit expansion measures are taken to stabilize the economy. Economic growth as measured by the GDP is now a function of Government and private consumer spending financed by the credit expansion or put it simply ‘debts’. In the short run this might help mitigate the pain associated with a slowing economy such as a recession. Preventing a recession also means preventing the economy from performing its natural task on rebalancing such as getting rid of excesses accumulated along the way. One of the side effects of excesses is the inflating of assets prices to bubble levels. As a result we have various bubbles blown in the stock market, real estate, bonds and futures market in Malaysia. Bubbles are created by misallocation of resources because credit is not directed to the most efficient part of the economy. Take for example to prevent a downturn in our housing market, interest rates are kept low and credits are made easily available. With low down payments our local speculators are able to purchases a few houses in one go due to the low monthly mortgage payments. It is like buying a lottery ticket where the returns are very high with a small investment. This can happen in the housing market if speculators can find greater fools to buy it from them every few months. With leverage of up to 300% in margin accounts, it will be difficult to prevent people from buying lottery tickets in the stock markets as well. Betting on such high leverage can only go on as long as the markets kept going up. There will be bloodbath when the markets implode sooner or later. Other form of misallocation of resources or mal-investments happening around our country includes the following. Crony capitalism. Bankrolling cronies at the expense of other businesses in the economy. A good example will be supplying cheap electricity to IPPs (Independent Power Producers). Bailing out GLCs. Bailing out loss making GLCs like MAS, Proton and so on does not help improve the economy. It’s like throwing money into a bottomless pit. Better channel the funds to provide credit to other industries to help improve their capacity and efficiency. Cost Overruns in public projects. A good example is the recent KLIA 2 project. Construction costs have ballooned from an initial RM1.7 billion to more than RM 4 billion. One way to justify cost overruns due to the rise in raw material prices, raining season and so on is by issuing VO or Variation Orders. Variation Order is one method used by companies participating in a tender exercise to quote at a very low price. Once they landed the projects then they will use Variation Orders to mark up the costs of the project and hence generate hefty profits in the end. Overpriced Public Sector Procurement. Recent report by the Auditor General reveals of exorbitantly over priced items supplied to our Government. Procurements of RM500 screw drivers, RM2000 car jacks and RM30,000 notebooks are common occurrence in the public sector. Wastages. Again the Auditor General also reveals massive wastage in the public sector. Buying things like odd sized safety shoes, under powered computers, building unusable open air public futsal courts, unsuitable or unusable defence assets and so on. The above shows how our Government literally throw ‘good money after bad’ but that is just the tip of the iceberg. Earlier attempts to bolster consumer spending to lift the economy is not a long term solution either. As a result of the easy availability of credit through channels such as personal loans and credit cards, consumers are spending recklessly on fine dining, overseas travel, luxury goods and so on. The following graphs illustrate the composition and extent of the debts incurred by both the private and public sector in 2012. From above we can see that our households are spending un-necessarily. 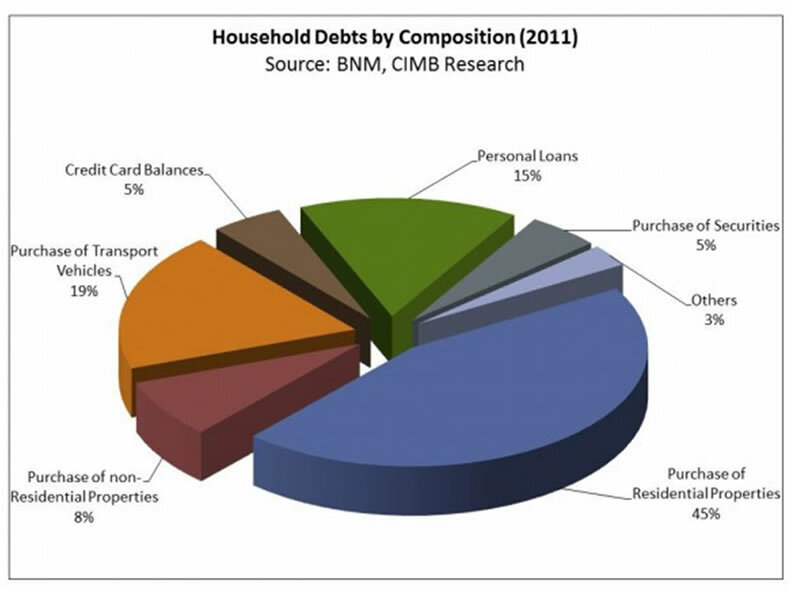 More than 70% of the debts are incurred by properties and followed by vehicles purchase. This unscrupulous spending has led to many of them unable to repay their debts and thus went into bankruptcy. The following graph shows the number of bankruptcy cases in Malaysia is on the rise since 2002 and heightened after 2008. A recent study by HSBC shows that Malaysia’s addiction to debt has gone to unsustainable level and being one of the highest in Asia after China. Malaysia’s credit intensity of Growth has increased to more than 2x in 2013. Credit intensity to growth measures the amount of borrowing or debt to achieve a unit of growth. Studies have shown that in normal circumstances in an efficiently managed economy a $1 debt will generate an increase of $1.60 in GDP growth. This is because due to the effects of fractional reserve banking and the multiplier effect generated from bank loans, the resultant GDP growth should be higher than money supply. However as shown by the chart below, the credit intensity of growth in Malaysia soared from 0.7x during 2003-2007 to about 2.3x in 2013. This means that efficiency of capital utilization in Malaysia has been decreasing. To make it simple, during 2003-2007, we needed about RM0.70 to produce RM1 of GDP but in 2013 it went up to RM2.30. Thus our Government need to borrow more money to maintain the existing level of GDP growth. There are many ways a country can increase its economic growth like increasing productivity, capital investments, enhancing efficiency through technology, production processes and so on. To achieve any meaningful level of economic growth, the amount of funds invested into the economy should produce at least an equal amount of economic growth. In an efficient economy, this will mean that an X amount of investment should produce an X amount of growth. In layman’s term a RM 1 input (debts) should produce a RM 1 output in GDP. 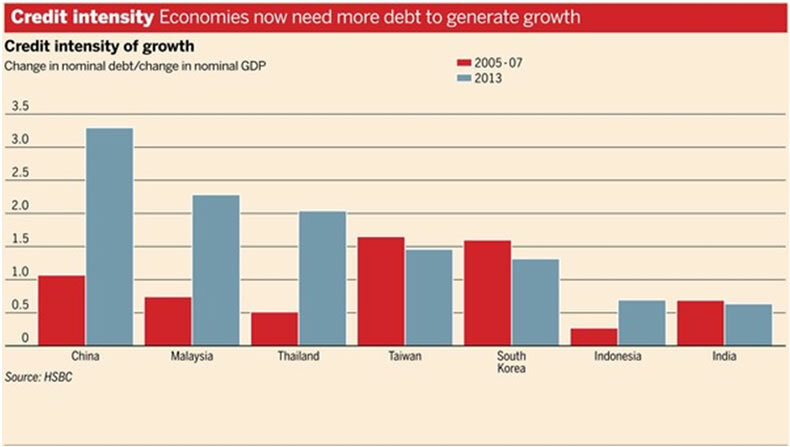 In a debt laden economy like Malaysia, our Government has to increasingly rely on debts to enhance its economic growth. Before we go on let me present you two graphs which are important for our analysis. Those are the GDP annual growth rate and Government Debt to GDP. The following table is generated from the above GDP growth, Government Debt to GDP and the GDP growth rate to Government Debt. As can be seen, the third column which is the GDP/Debt growth rate has been sliding since 2010. The negative ( -6.7%) growth rate in year 2009 was due to the effects of the Global Financial Crisis in 2008. However economic growth did picked up in 2010 to 7.55% but at the expense of higher debt load which seen soared from 41.24% to 52.82%. This represents an increase of 28% in the Debt/GDP. This can be illustrated graphically below. The above chart illustrates the effects of earlier mal-investments on our economy. Due to misallocation of resources much precious capital are wasted because they are redirected to inefficient sectors of the economy. Thus there is not much economic benefit or productivity generated from those investments. As a result the GDP Growth/Debt or economic growth generated by debt has been sliding downwards since 2010 from 14.1% to 8.4%. Although our Government Debt to GDP increased to a record 54.8% which is only a tad lower than the stipulated 55%, we achieved a lower GDP growth of 4.65%. The reason for this is that we have reached a diminishing return on our debts which can be shown by the following graph. As seen there will be a saturation point where any additional debt will not boost productivity and thus increasing the debt load will lead to lower productivity. Interest Due = 4.01% x $317.64 billion x 3.21 x 0.548 = RM 22.4 billion. There are three consequences arises from using debts to finance economic growth. Firstly, there is a trade off in what we called ‘opportunity costs’ in economics. Opportunity costs in this case refer to alternative ventures that are forgone in order to pay for the interest rates. Money used to pay interest rates instead can be diverted to build more schools, hospitals, roads, bridges or parks for that matter for the benefit of the people. Secondly, due to the diminishing return on debts, more money will be needed to achieve the same amount of growth. To further accelerate growth obviously more debts will be incurred due to the mal-investment arises as a result. So, what is the point of diverting more money into a bottomless pit? The following chart shows this phenomenon that is affecting not only Malaysia but most of Asia. Lastly and most importantly our Government is plundering tomorrow’s treasure today. As seen, our interest payments will keep rising when as long as we are addicted to debts. Put it simply, we are spending our children’s wealth and leaving them paying the bills tomorrow. What used be the traditional Capitalistic model of economic growth where capital is generated from savings as a result surplus production. It has now transformed into a something for nothing economic system where we don’t need to save in order to generate capital. Governments can now generate capital by a new technology called the ‘Printing Press’ where they can churn out as much money as they can. The ability to print money has led to an enormous abuse of power by our politicians as they can buy influence and power through corruption. And at the same time they can prohibit capitalism, competition and freedom which led to many monopolies in our country. Monopolistic companies such as Tenaga Nasional and Plus are able to maintain high prices and raising prices without the need to worry about competitors. Thus, we don’t need to be a rocket scientist to figure out why RM1 in debt generates less than RM1 in GDP growth is not sustainable. It is just a matter of time when our economy will be crash landing. The current state of affair of our country can best be summed up by the following phrase. When you see that in order to produce, you need to obtain permission from men who produce nothing; when you see that money is flowing to those who deal not in goods, but in favors; when you see that men get rich more easily by graft than by work, and your laws no longer protect you against them, but protect them against you...you may know that your society is doomed.